Regulatory expectations and financial markets continue to evolve. Ensuing from these shifting landscapes are heightened pressures on the shoulders of investment firms to deliver greater transparency, manage complex relationships, improve the overall due diligence process and utilize mass data in a more interactive and intelligent way. 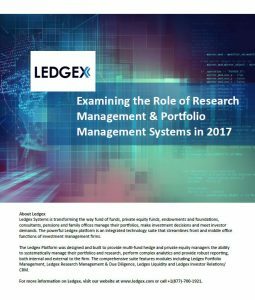 What are the key benefits of utilizing a Portfolio Management (PM) solution? What are the key benefits of utilizing a Research Management Software (RMS)? How do PM and RMS work together? What are the most common motivators for adopting these solutions? What are top considerations when evaluating PM and RMS solutions?